Cyber-terrorism is a broad term that refers to acts associated with the convergence of terrorism and cyberspace. Generally, cyber-terrorism involves unlawful attacks or threats against computers, networks, and the information stored therein to intimidate or coerce a government or its people to achieve political or social objectives (Denning, 2000). These acts can range from taking control of a host website, to using networked resources to directly cause destruction and harm. 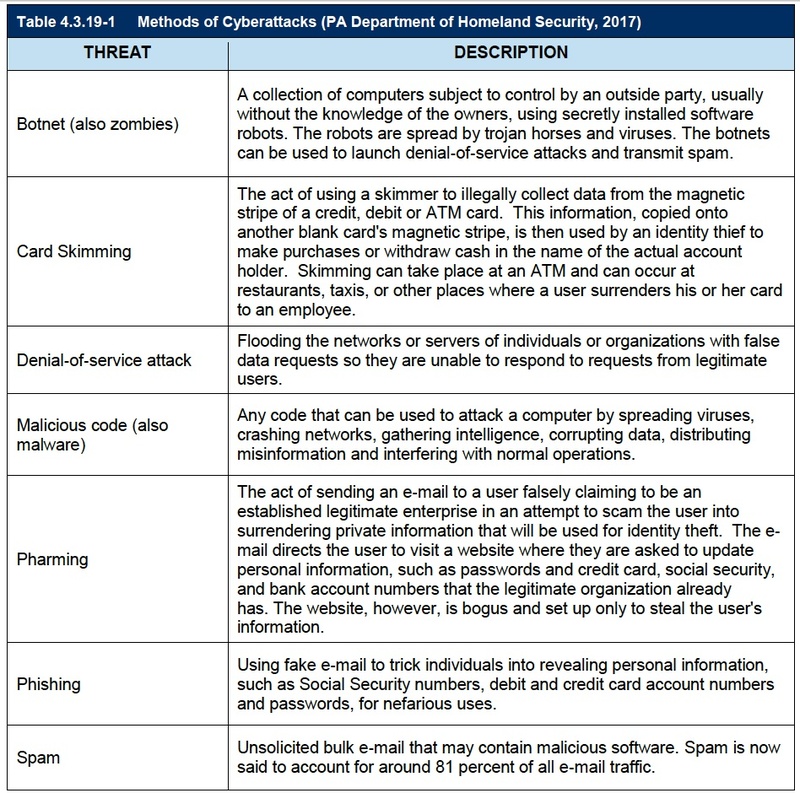 The Pennsylvania Department of Homeland Security defines the following types and methods of cyber-attacks: Botnet, card skimming, denial-of-service attack, malicious code, pharming, phishing, spam, spear phishing, spoofing, spyware, trojan horse, virus, and worm. Cyber-terrorism can cause severe disruptions to transportation, public safety, and utility services, all of which are critical infrastructure that are highly dependent on information technology. All state agencies, as well as individuals, businesses, and other institutions in the Commonwealth, are potential targets for cyber-terrorism. Potential threats include identify theft, loss of sensitive information, disruption of services, and other malicious activity. 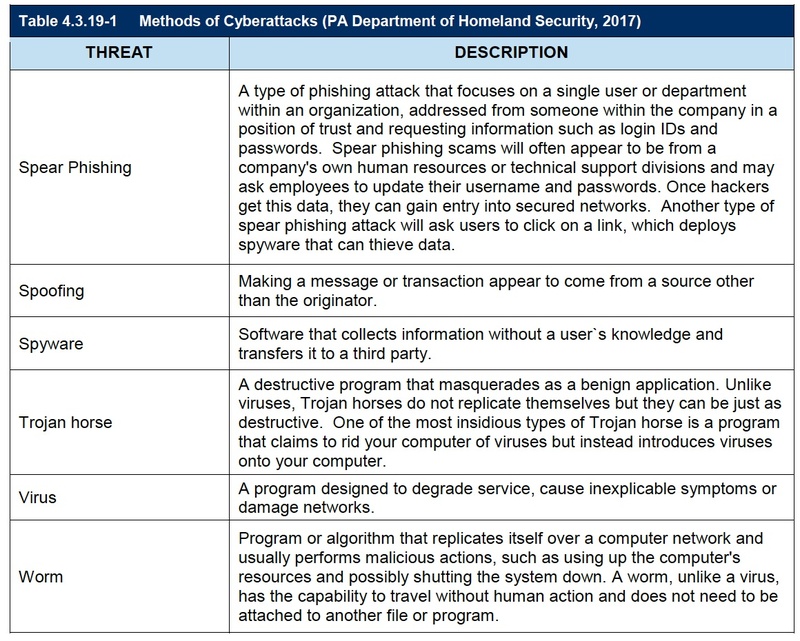 Since 2012, four cyber-terrorism related incidents have been reported to PEMA. In 2014, the largest data breach in history impacted over 3 billion Yahoo user accounts. Another large-scale attack was the Equifax data breach in 2017, which was estimated to potentially impact over 5.5 million residents of Pennsylvania and over 145.5 million nationally. The Commonwealth of Pennsylvania is a leader among states in cyber-security and takes many steps to prevent and defend against cyber-attacks, reduce vulnerability, minimize damage, reduce recovery time, and promote education and awareness. This includes employing multiple layers of security, advanced monitoring, vulnerability testing, data protection, antivirus, spam blocking, mobile device encryption, and other means to protect state systems and data.